The final Monday of January saw the hosting of our Carbon Literacy Pioneers Network, at HOME, Manchester. 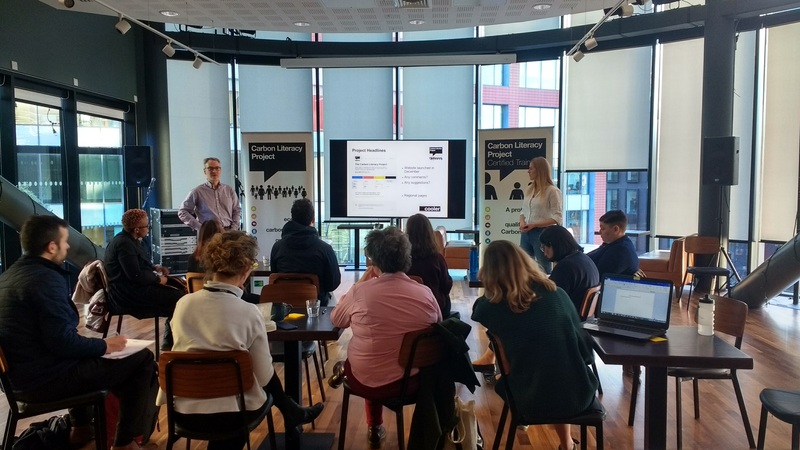 These events are an informal space for facilitators, trainers and consultants, (formally certified or not), delivering Carbon Literacy training to any audience, to come together to meet, exchange experiences and share best practice from across the UK. It is also a chance to set up collaborations, hear from a few expert guests, and find out the latest information about Carbon Literacy directly from The Project. Following an informal meet and greet with who was in the room, we went through some of the exciting things The Project has been up to since our last Pioneers event. We spoke of the launch of the new CL website, along with the release of our updated and improved evidence form to collect learner’s personal and group actions. It was really helpful for us to get some feedback on the use of these new evidence forms from the trainers themselves – how they’d found it so far and any insights into its use. We spoke in-depth on the additional question surrounding ‘what we need to do as a society to be zero carbon by 2038’. It was agreed that a little extra time is needed for completion of the form compared to the older version, but overall the new evidence form has been met with positive comments. Our trainers felt that this question has brought an extra depth to the forms that perhaps had been missing before – enabling learners to further explore ideas around a zero carbon world before pledging their own actions. It means that participants hopefully have a much better understanding of the urgency and scale of action required, by the end of the training. A top tip that Emma had been told by another trainer, was to go through the form at the start of the day, meaning that learners have the questions in mind throughout the training and so engage more deeply with the materials around becoming zero carbon, in the knowledge that they will be ‘tested’ on this at the end. We also discussed the qualities a good Carbon Literacy trainer should possess. Through this discussion, we hope to collaborate with and include our trainers in the creation of a ‘code of conduct’ for Carbon Literacy trainers. The aim of this document is to help maintain the current high standards of training seen across Carbon Literacy, as The Project continues to grow across the planet. The session drew to a close after asking the trainers to share top tips they have learnt through their own experience of delivering Carbon Literacy. We felt this was important in terms of sharing best practice and enabling trainers to gain insight into different ways of engaging learners. We will be writing up these tips and sharing in a blog shortly so keep an eye out for when we do! Our next Pioneers event will be held in April 2019, shortly after the second Greater Manchester Green Summit, where I’m sure we will have much more to share with you and collaborate on.